T - Prior to the rise of the Incan Empire, Tiwanaku was the cultural center of a tribe long lost to the world. From about 300 BCE to 300 BC, this group spread through a large portion of South America, colonizing areas that once belonged to smaller tribes and groups. They were rather advanced when it came to farming, using an exhaustive technique that wielded even more product than many modern farming techniques. As a result, they were able to support a massive number of people. It's estimated that anywhere from 200,000 to one million individuals called the city of Tiwanaku home during the height of the civilization. They were also quite skilled at negotiating treaties, which allowed them to flourish by forcing other civilizations to become dependent upon them. With no written language, little remains of this society now, including their name. But what we have found in the ruins is fascinating. The people of Tiwanaku participated in a rather brutal form of human sacrifice in which they would rip an individual open and disembowel him or her. Gods and religious beliefs from other societies were also often swallowed up by the Tiwanaku people. When the city was found in the 1500s, evidence of many other religions was found among the ruins. The Tiwanaku people would carry these beliefs and artifacts back to their city and add them to their own pantheon, most often in a subordinate position to their own gods. One of their most important gods was Viracocha, who created the world and organized everyone into societies (which the Tiwanaku continued to do through colonization of South America). Viracocha came from Lake Titicaca during a period of great darkness. As he rose from the waters, he created the sun, moon, and stars. He then made Giants to carry the rocks which eventually built Tiwanaku. But these Giants angered Viracocha, so he sent a great flood to destroy them. Once destroyed, Viracocha started over with a new race at Tiwanaku. He breathed into small rocks to create humans, and then wrote his instructions for civilization down onto a giant piece of rock. Of course, his people couldn't read, so he drew great lines in the rock, and demanded that his people settle into each of those areas and name the tribes to live therein. The spreading of the Tiwanaku society was their way of following that instruction. His mission thus completed, Viracocha walked out onto the water of the ocean and disappeared, never to be seen by his people again. But he did not vanish from the world entirely. Viracocha wandered, teaching others and working miracles. Interestingly enough, Viracocha was a white man, dressed in robes, who carried a staff and a book. He frequently dressed as a beggar. As the Tiwanaku society began to lose power, the Incan Empire rose. 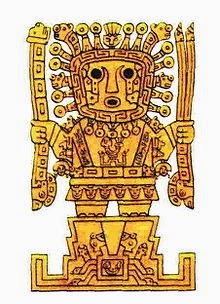 Viracocha became an important deity in their pantheon, taking on the same creator role as he did in the earlier Tiwanaku society. And, as with so many others from around the world, the similarities between Viracocha and Jesus are striking.